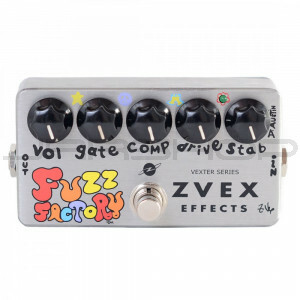 The Vexter Fuzz Factory is identical in construction to the newest hand-painted Fuzz Factories, including a DC power jack and on/off LED indicator. Because it is hand silk-screened instead of hand-painted, we are able to offer it at a somewhat reduced price! This is a five-knob fuzz using two new old-stock sixties germanium transistors. The circuit is not modeled after any classic fuzz design, but should have been around when Leary was still lucid. Although the five knobs are named for the parameters over which they seem to have the most control, please don't hold me to it. They are controls for various operating levels and biases, and basically shape you a personalized fuzz. Squelches noise after end of sustain. Turn to right to eliminate squeals, hiss and buzz, stopping just as they disappear, or use to tune in exact feedback pitch, if you're that kind. Turning to left opens gate. Increases distortion when used as a "normal" fuzz, and adjusts feedback pitch and tonal thickness, if you're that kind. This control becomes meaningless when Compress is all the way right. Yes, folks, like all Z. Vex pedals, it's as low current as possible, extending battery life so long... I have never changed the battery in the prototype (3 years). 'On' current is less than 3 mA... compare to the Tube Screamer (of course an entirely different animal) at almost 40 mA. Z.Vex “Vexter Series” effects are hand-polished aluminum, hand silk-screened in two colors and hand assembled. They are produced in small batches by umm, elves. Stab: Lower from fully clockwise while playing open 'A' with left hand. Stop at most interesting tone.